If Dorothy, the Tin Man and the rest killed zombies instead of fighting winged monkeys, it might look something like this. Four individuals (and a dog) with little in common are thrown together by fate and must work together, overcoming challenge after challenge in their way, in order to survive. It's practically the same story, only one group doesn't get a Good Witch to help them out and one group needs to deal with magical poppy fields. Okay, maybe it isn't the same story at all, but wouldn't it be badass if it were? The Left 4 Oz image you see here to the right was created for ConceptArt's "Character of the Week" contest, the entries for which can be more easily seen on SuperPunch. While some of the other entries are cool, none of them are Left 4 Dead which automatically makes this one the coolest of them all. What I like the most about the mock poster is how effectively it apes the style of Valve's actual Left 4 Dead campaign images. 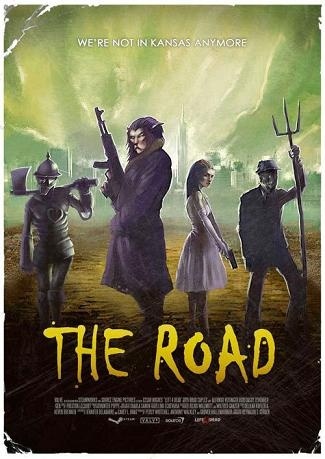 You have the four Survivors standing together in cool poses holding their various weapons, you have the cheesy-yet-awesome campaign title ("The Road," in this case) and an equally cheesy-yet-awesome one-liner catch-phrase. Seeing as how two of the Left 4 Oz Survivors are using melee weapons - the Tin Man's wood axe and the Scarecrow's pitchfork - this game would clearly be using the L4D2 engine, which makes me wonder what sort of Uncommon Infected this level would have. Zombie Munchkins could be cool, but they'd be a bit too much like the Jockey. Zombie Winged Monkeys, on the other hand? Is that a recipe for childhood terror or what? I'd totally play this game. I really, really would. The only question in my mind is: Would all the original L4D fans hate Dorothy because she isn't their precious Zoey? I guess we'll (unfortunately) never know. Dibs on playing as the Cowardly Lion.